It's been a stressful couple of weeks at the Smith house. We're trying to get everything ready for our little additions. Emotions are running high. Christmas is just a few weeks away but its hard to focus on anything other than the pregnancy. So much to plan. My mom (Nana) and my sister in law threw Karyn a baby shower and to Karyn's surprise, her mom (Grammy) and sister came. They flew down from Boston for it. I know how special that was for my wife. Very cool that they could come. 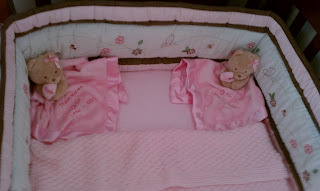 I want to say thank you to everyone who spent the time and money to help us prepare for the little ones. It means a lot. Our families rock. God and family are the greatest gifts. Even if you don't always get along, you only get one set. Sometimes you have to bite your tongue. Sometimes you won't be able to. When that happens, you ask for forgiveness and move on. Love your family but stand for something. You can always find common ground. We visited the specialist for my wife's thyroid tumor a few days ago. There isn't a lot he could tell us. They really won't know until they get in there how serious it is. I can tell you, it's VERY serious to us already. Like someone told me, "It's only minor surgery if it isn't happening to you." That's the truth. My wife has kept her sanity through all of this better than I have. I worry a lot about her and our family. My faith in God is very strong but I am weak. I'm emotional just writing this. In the end, I know everything will work out and God has His plan. We won't go back to the specialist until after the babies are born and she has the surgery. Pray for my beautiful wife's speedy recovery. I know I will. I don't think my wife and I have slept a whole night in weeks. It wears on you. I know what she's doing is special. I've been told (repeatedly) that I don't, and never will, understand what she is going though. This is true. Nobody does, or ever will, unless they have carried twins while battling a thyroid tumor. She's an incredible woman. The strongest that I know. While I have never felt the hormone changes, the leg cramps, and the constant pressure on my bladder of a tiny being (2 tiny beings), I've been there to support her every step of the way. I try to take as much responsibility off of her as possible. I even massage her legs in the middle of the night. I love her so much. We have a great relationship and I'm so thankful for her. People on the outside looking in will never understand it. I joke with her and she jokes with me. She's a little more private than I am. We even have our own ways of venting frustration. I sometimes look like a jerk to those not in the know and that's OK. I'm going to be me. There's a reason that my wife fell in love with me so why would I want to change it? I've always heard and am happy to share with my little princesses this bit of advice. "If it ain't your tail, don't wag it." It means to mind your own business because you never know what someone is going through and if you respond in a negative way, it could be the last straw. Instead, be supportive and offer guidance. That's what a Christian is supposed to do. My friend and coworker, Darrin Perryman, knew I was having a tough week and sent me a message with a couple bible verses. Isaiah 41:10 "Fear thou not; for I am with thee: be not dismayed; for I am thy God: I will strengthen thee; yea, I will help thee; yea, I will uphold thee with the right hand of my righteousness." and Romans 5:3-5 "And not only so, but we glory in tribulations also: knowing that tribulation worketh patience; And patience, experience; and experience, hope: And hope maketh not ashamed; because the love of God is shed abroad in our hearts by the Holy Ghost which is given unto us." Yes sir. That's what I needed. I often take the Word of God for granted. Sitting there looking at those words, and what they mean, gives me comfort. I'm so blessed. I've thanked God several times this week for all of these things that I was complaining about. Thank you Darrin for giving me the scripture I needed to get me back to where I needed to be mentally. We've painted the nursery and set up the crib. We added some stuff to the walls but still have a lot to do. The rocking chair Grammy gave Karyn when she was pregnant with Isaiah has been placed in just the right spot. I can truly say that a lot of blood, sweat, and tears went into it but it's a labor of love. We have the boys settled in a room together and they're enjoying the bunk beds. Nana came over with my little sisters, Kayela and Kayelene, and they cleaned the carpets and helped Karyn organize the babies' clothes. So thankful for their help. My wife said it's like the Christmas parade getting you in the holiday spirit. The nursery has us in the newborn care giving spirit. We go back to the baby doctor in 5 short days and we get another ultrasound. Yay! I'm excited to see my little dolls and find out how much they have grown. I'll keep taking care of Mommy and giving her lots of love. I'll keep saying bedtime prayers with the little ones in her tummy. I'll keep striving to be the best daddy I can be to Isaiah and Jason. Last but certainly not least, I will continue to trust God to guide me in the right direction to carry out His plans. Everything else will fall into place. Thank you for your continued prayers. They are appreciated. sorry you have had a rough week Jason. know that i'm over here in arkansas praying for you, Karyn and the boys! miss you and your fun-loving, always a true friend spirit still, 3 years later. i have always respected you and karyn, and how you deal with life. God is on your side. "The Lord knows those who belong to Him..." 2 Tim. 2:19. sharing the journey friend.